Justice Minister Ayelet Shaked spoke at Bar Ilan University on the definition of a Jewish and democratic state. 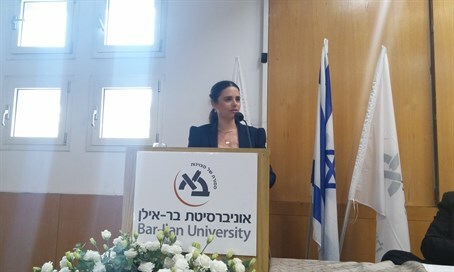 Minister of Justice, MK Ayelet Shaked (Jewish Home), spoke at the "breakfast forum" conference Monday morning on the subject of a Jewish and Democratic State in Bar Ilan University. The minister said that the term "Jewish and democratic" is a new term, which did not exist when former Prime Minister Ben-Gurion declared the founding of the state. “This formula of bring 'Jewish and democratic' is totally new." The Justice Minister referred to a national law she submitted by the Knesset last year, "during the previous Knesset, I submitted with my colleague, the Minister Yariv Levin, the Basic Law: Israel as the national and religious state for the Jewish people.